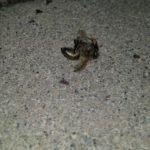 Are The Bees Really Dying? Will We All Die With Them? Let’s thank the mercury-free dentists who serve us today. As environmentally-responsible community members, they recognize that amalgam is a significant source of mercury pollution. 450 days and counting….When’s FDA going to act on dental mercury? In fact, not a single scientist on FDA’s advisory panel agreed with FDA’s 2009 rule that promoted unrestricted amalgam use in children and pregnant women. Mercury treaty requires countries to phase down dental amalgam! Amalgam is the only mercury-added product with a road map for how to phase down its use, providing nations with specific guidance on what measures can be taken to transition to mercury-free alternatives. That’s how seriously the nations are taking this issue. AFTER YEARS OF TELLING PEOPLE CHEMOTHERAPY IS THE ONLY WAY TO TRY (‘TRY’, BEING THE KEY WORD) TO ELIMINATE CANCER, JOHNS HOPKINS IS FINALLY STARTING TO TELL YOU THERE IS AN ALTERNATIVE WAY .